Democratic candidate for Congress looks back on his Army experiences, how that service helped prepare him, and gave him perspective. MOUNT PLEASANT, WI - Less than 1% of citizens serve in the armed forces, and that makes veterans a kind of novelty wherever they are. My status as a veteran of Operation Iraqi Freedom (OIF) tends to generate a lot of questions. Once I became a candidate for Congress, the questions increased. There was a lot of interest to know my story. I was asked if I would share my experiences with all of you. I have put it off for a while because when I think about it all, a flood of emotions of all sorts hits very hard. I look back on my days with my fellow soldiers with a sense of nostalgia while at the same time, contemplating all that comes with war also sticks out in my mind. I had wanted to serve since my childhood. I enjoyed history, and I looked up to those who had proudly served to defend the country. My father served during Vietnam. He has not said much about it. I’ve never really tried to get more information. I grew up with a strong sense of responsibility that one takes care of those less fortunate, protects the innocent, and respects others. I enlisted in the Army as a medic, and I left for basic training at Fort Benning, GA on 2 June 2004. 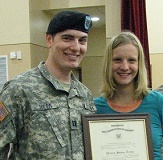 I completed my medic training at Fort Sam Houston, TX, graduating in the top 10 of my class. I was then stationed at Walter Reed Army Medical Center in Washington, DC for a short time. While there, I was given the opportunity to apply for a commission as an officer. Shortly after being transferred to Wiesbaden, Germany, I was notified that I had been selected for commissioning. On 22 June 2006, I was a Specialist (E-4), and the next day, I was a 2nd Lieutenant (O-1). I was promptly transferred back to the United States for officer training. My first officer assignment was as an Executive Officer. The unit I would deploy with, was the 98th Medical Detachment (Combat Stress Control), with the 62nd Medical Brigade in Fort Lewis, WA (now Joint Base Lewis-McChord). I remember my thoughts before deploying. At the time, my wife and I had two children. I ran the outcome scenarios of their lives should the worst happen. I was nervous and worried. But, I was also very determined to do my best for my soldiers. We had worked and trained together for many months to prepare for our mission. We were a great team. We served with distinction, and received a Meritorious Unit Commendation for it. The Army experience gave me a great deal of pride knowing that I was serving my country. But it also provided some additional perspective. While serving at Walter Reed, I was witness to the human cost of war. Every morning, as I walked across campus, I saw injured service members arriving for their appointments. The injuries were as varied as the people who had them. I remember one morning, as I was walking to my building, I saw a soldier in a wheelchair being pushed by a person that I assume was his wife. He was missing both legs above the knee. I remember that single moment in time not because of his wounds, but because of the look on their faces. I could tell they had been through a lot. Neither one smiled. They simply kept moving, as if all emotion had been forcibly removed from their lives. They were clearly exhausted. I walked by to continue my day. But, that moment will stick with me forever. When I was in Iraq, our clinic had constant activity. I was there almost daily. Many soldiers came for counseling, or just because they needed a mental rest. Some had looks similar to that couple. I never was in combat while I was there. I had a different job. I was taking care of those who took care of the other soldiers. I’m proud of our unit and what we accomplished. We helped a lot of people. I look back now on those experiences, and I understand that there is a price of military conflict that exceeds just money. It exceeds physical injury. It doesn’t end after the conflict is over. Those who were there understand. Many don’t talk about their experiences because of the pain, or because they don’t believe that anyone could really understand their experiences. Many of them are still seeking to fill the void left behind by the piece of their soul that they sacrificed in the countries where they fought. It is absolutely imperative that we take care of our veterans. They have given so much for this country. All service members depart a war zone knowing that their lives are changed forever regardless of their job. For me, it was a life lesson that freedom comes at a cost – a cost that is willingly paid by the small percentage who proudly serve. We should never take for granted the sacrifices made by our military members. Violent conflict is not a decision to be made lightly. We must ensure that if we are going to use the incredible power of our military, we must use that power for the right reasons. I honor our military, often in my own quiet ways. Despite some of the tough times, there were also a lot of great times. Serving made me a better person. I wish I still maintained contact with all of the friends I served with. To all of my fellow service members past and present, thank you. For those friends that I have managed to keep up with, thank you for impacting my life in so many ways, and helping to shape me into the person I am today. Senate candidate Russ Feingold supports Sen. Elizabeth Warren's bill which would allow students to refinance their student loans. MADISON - Democratic Senate candidate Russ Feingold helped some students move into their new apartment in the campus area Monday and talked about college affordability. Feingold, from Middleton, said that to help solve college affordability problems, there needs to be legislation like the bill U.S. Sen. Elizabeth Warren, D-Mass., sponsored, which would allow students to refinance their student loans. A report of the visit from the Badger Herald is presented below. Democratic Senate candidate Russ Feingold helped some students move into their new apartment and talked about college affordability early Monday morning. 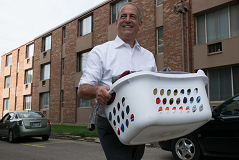 Feingold told reporters during the move-in affordable for students and families, which would reduce post-graduation loan debt. He told reporters d the average debt for those graduating from the University of Wisconsin is $28,000. “I consider the issue of student loans and student debt to be one of the most important issues in the presidential race and in our race,” Feingold said. Feingold, a former Wisconsin senator and UW alumnus himself, said the state of Wisconsin has greatly diminished the support given to tuition in comparison to when he was a student. He said to help solve college affordability problems, there needs to be legislation like the bill U.S. Sen. Elizabeth Warren, D-Mass., sponsored, which would allow students to refinance their student loans. Feingold criticized his opponent, incumbent Sen. Ron Johnson, R-Wisc., stating that Johnson voted against the bill and does not support federal student loans. “It’s very sad that Wisconsin’s senator, Senator Johnson, doesn’t believe that our students here on this campus and across the state should get the benefit of student loans,” Feingold said. Refinancing bills has drawn criticism in the past from Republicans who argue refinancing doesn’t actually help students and is too costly for taxpayers. According to the most recent Marquette Law School Poll, Feingold is currently six points ahead of Johnson in Wisconsin’s U.S. Senate race. In addition to reducing interest rates, Feingold said he would like to see a new program created that could prevent students from paying huge amounts of tuition. He said funding would need to be from the state, universities, federal government and families who can afford to pay. Feingold also pointed to this past weekend’s protests and violence in Milwaukee. He said lawmakers and citizens need to work together to reduce the violence and tension in those communities. “We do have to be clear that there is a level of tension and suspicion in our communities that makes people feel uncomfortable and nervous about encounters with police officers that are justified,” Feingold said. The tension will not be reduced, Feingold said, until there is a change in the economic reality for families living in those areas. He also said there needs to be constant community dialogue between all parties, not just during incidents. Feingold will face off with Johnson in the upcoming general election Nov. 8, 2016. 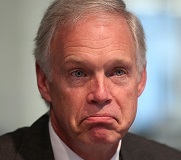 Sadly, it wasn't Sen. Ron Johnson of Wisconsin. MIDDLETON - With Senator Toomey coming out against the TPP today, Senator Johnson is now one of the last senators who refuses to tell voters where he stands on the issue. Johnson has remained silent on the TPP for more than 286 days, claiming he needs more time to review it, despite the fact that almost every other senator has had enough time to make up their mind. Last month, Johnson admitted that he wouldn’t tell Wisconsinites his position until after the election. Senators from both sides of the aisle have come out against this raw deal written in secret. But Senator Johnson is more concerned with the big corporate interests that have bankrolled his campaign than with middle and working class Wisconsinites. Like a true Washington politician, Sen. Johnson has preferred to play politics rather than level with voters about his position. Wisconsinites know where he stands though. After all, Johnson has a long track record of supporting bad trade deals. He voted to fast track the TPP and praised the “creative destruction” of deals like NAFTA. "Senator Johnson's 286 days of silence on the TPP speaks volumes about what matters to him: the big corporate interest who have bankrolled his campaign. He makes one sorry excuse after the next about why he won't take a position, but Wisconsinites see through Senator Johnson’s political games. Senator Johnson has spent his career in Washington greasing bad trade deals. Whether it’s voting to fast track TPP, praising the 'creative destruction' of deals like NAFTA, or voting for every single trade deal to cross his desk, Sen. Johnson is obsessed with protecting corporations that send Wisconsin jobs overseas. It’s time for Senator Johnson to come clean and tell Wisconsinites where he really stands on TPP." -- RFW Communications Director Michael Tyler.